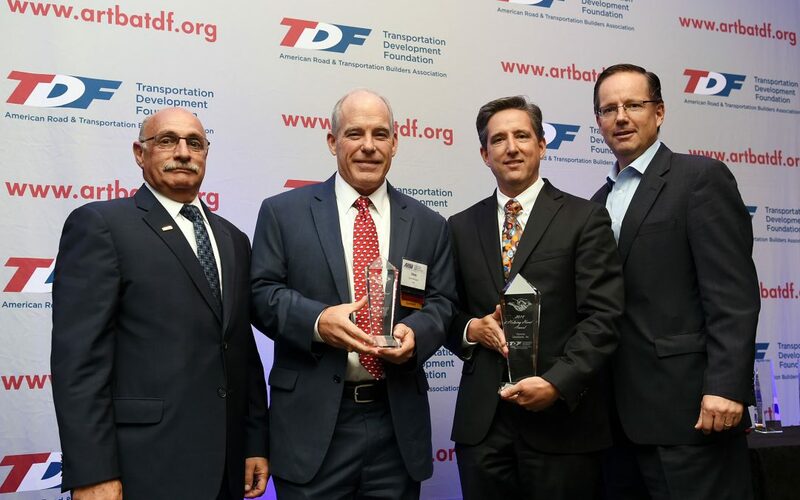 The ARTBA Foundation presented its annual “Contractor Safety Awards” and “Helping Hand Awards” during a May 15 luncheon at the 2018 Federal Issues Program in Washington, D.C. The “Contractor Safety Awards” were created to promote worker safety and health as core values of the transportation design and construction industry. Award winners demonstrated a low “OSHA Recordable Rate” as measured against benchmark metrics established by the Bureau of Labor Statistics. Finalists were selected based on their achievements, as evidenced by recordable rates below the industry average. Representatives from each company made presentations during a webinar to a panel of industry professionals. A panel of industry experts evaluated the entries based on corporate safety culture, operational safety plans and worker training programs. Second Place, F.H. Paschen, Chicago, Ill.
First Place Tie: Granite Construction, Watsonville, Calif., and Barriere Construction Co., LLC, Metairie, La. The “Helping Hand Awards” recognize extraordinary programs – outside the scope of normal business operations— that demonstrably benefit and help improve the quality of life in the community where the company is based or conducts business. Terracon Consultants, Inc., of Olathe, Kan. was named the 2018 first place winner. Through the Terracon Foundation, the company’s employee-owners give back to the communities they serve by delivering safe, quality facilities and infrastructure projects that support strong, vibrant communities. Terracon encourages employees to submit requests for one-year grants for local organizations aligned with its company’s mission of “delivering success for its employees, clients and communities.” Each year, the company participates in hundreds of philanthropic and civic events near its 140 local offices across the nation. In 2017, nearly $300,000 in grants was provided to worthy causes. Since its inception in 2008, the Foundation has awarded more than $1.6 million to community organizations, universities, dependents of employees, and natural disaster victims. HCSS, a Sugar Land, Texas, construction software company, received second place recognition for the money and volunteer time its employees donated to the victims of Hurricane Harvey. Visit the Scholarships & Awards section of the ARTBA Foundation website to learn more.